Breaking news 28 August, 1845. I was reading Volume 1, Issue 1 of Scientific American today and this article was at the head of page 2. This mammoth of the ocean, which has recently arrived from Liverpool, has created much excitement here as well as in Europe; being in fact the greatest maratime curiosity ever seen in our harbour. 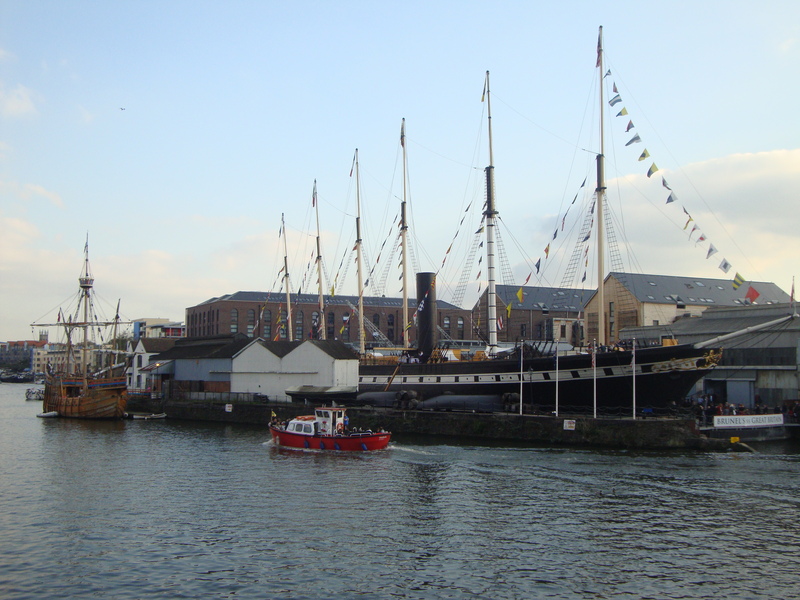 She was built by the Great Western Steam-Ship Company, at Bristol, England. 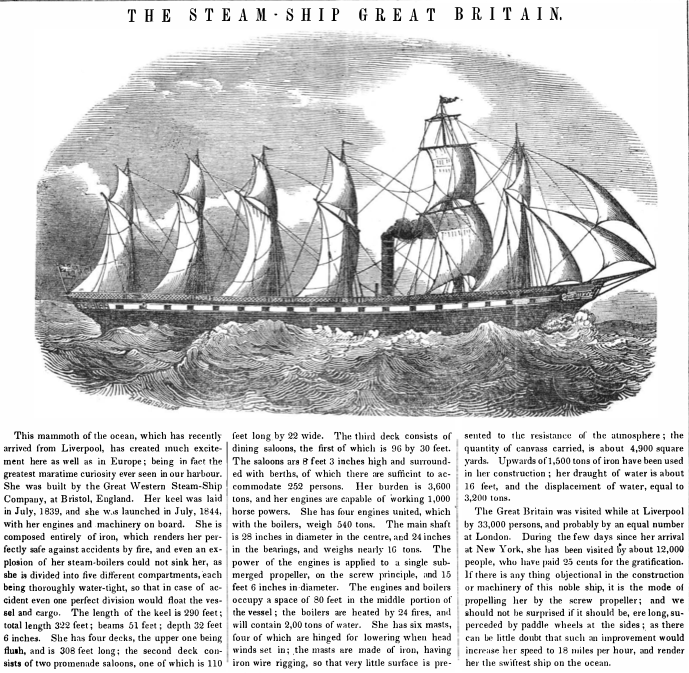 Her keel was laid in July 1839, and she was launched in July, 1844, with her engines and machinery on board. She is composed entirely of iron, which renders her perfectly safe against accidents by fire, and even an explosion of her steam-boilers could not sink her, as she is divided into five different compartments, each being thoroughly water-tight, so that in case of accident even one perfect division would float the vessel and cargo. The length of the keel is 290 feet; total length 322 feet; beams 51 feet; depth 32 feet 6 inches. 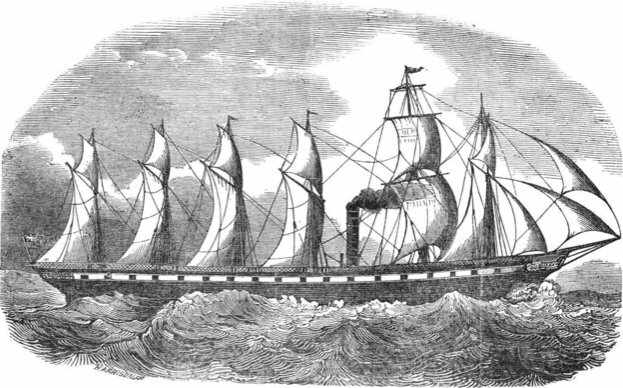 She has four decks, the upper one being flush and is 308 feet long; the second deck consists of two promenade saloons, one of which is 110 feet long by 22 wide. The third deck consists of dining saloons, the first of which is 96 by 30 feet. The saloons are 8 feet 3 inches high and surrounded with berths of which there are sufficient to accommodate 252 persons. Her burden is 3,600 tons, and her engines are capable of working 1,000 horse powers. She has four engines united, which with the boilers, weigh 540 tons. The main shaft is 28 inches in diameter in the centre, and 24 inches in the bearings, and weighs nearly 16 tons. The power of the engines is applied to the single submerged propeller, on the screw principle, and 15 feet 6 inches in diameter. The engines and boilers occupy a space of 80 feet in the middle portion of the vessel; the boilers are heated by 24 fires, and will contain 2,00 tons of water. She has six masts, four of which are hinged for lowering when head winds set in; the masts are made of iron having iron wire rigging, so that very little surface is presented to the resistance of the atmosphere; the quantity of canvas carried, is about 4,900 square yards. Upwards of 1,500 tons of iron have been used in her construction; her draught of water is about 16 feet, and the displacement of water equal to 3,200 tons. The great Britain was visited while at Liverpool by 33,000 persons, and probably by an equal number at London. During the few days since her arrival at New York, she has been visited by about 12,000 people, who have paid 25 cents for the gratification. If there is anything objectionable in the construction or machinery of this noble ship, it is the mode of propelling her by the screw propeller; and we should not be surprised if it should be, ere long, superceded by paddle wheels at the sides; as there can be little doubt that such an improvement would increase her speed to 18 miles per hour, and render her the swiftest ship on the ocean. A modern photograph of her, restored, can be found here. This entry was posted on 31 Mar 2012 at 23:33	by Rick	and is filed under Miscellaneous. You can follow any responses to this entry through the RSS 2.0 feed. Both comments and pings are currently closed.